I got the idea for this post from a blog post by Paul Randall: Capturing Wait Stats for a Single Operation. He shows how to use an extended event session to capture wait stats and then how to pull that data into a temp table. It was very helpful but it didn't show how to build the query if you were using a different extended event session. Extended Events were introduced as a replacement for SQL profiler and server side tracing. They are a great lightweight way to gather data from a SQL server. However, once you have collected the data into a file it can be difficult to use that data. This run book will detail how to pull the data from and Extended Event file into a temp table that can be viewed, sorted and aggregated. First we need to gather data from an Extended Event session. Connect to a SQL server and run the below code to create the extended event session. This will create an Xevent session that grabs rpc_completed, sql_statement_completed and sql_batch_completed. NOTE: Notice the session is logging data to this path: D:\DBA_Tools\XEvents\DBA_JR_QueryText . Modify this for your environment. NOTE2: Notice I have some lines commented out. You can uncomment them if you want to only capture events that meet a threshold. 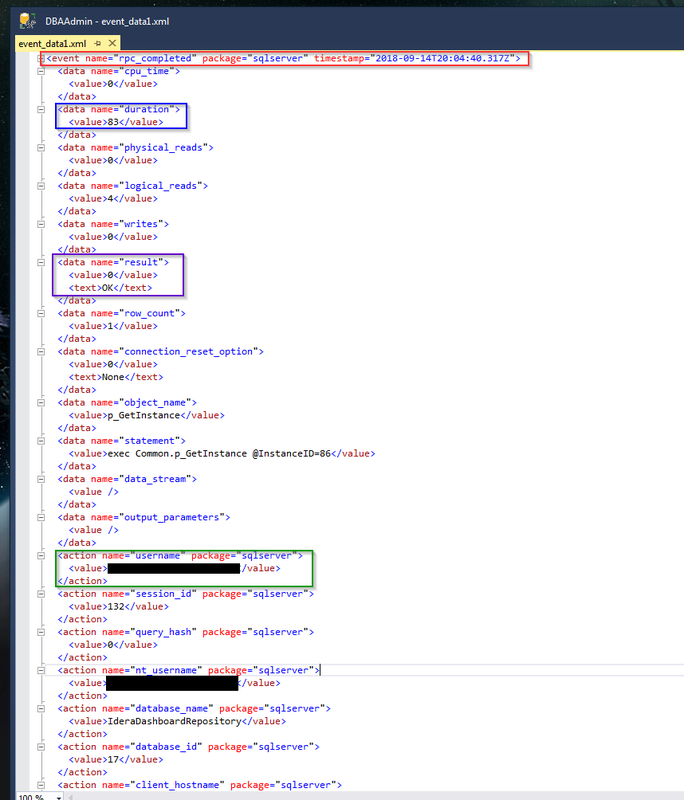 Next we want to click on one of the XML fields so we can see what data is in there. I have put boxes around four different elements in the XML. The green box is an action tag with a name and a package attribute and it has a value subtag. If you look up at the code that created the extended event you will notice we defined the actions. These are pieces of data that you don't get by default when you add a certain extended event. I have redacted the actual value since that is a username. Now we need to parse the XML using XQuery to get the data out and present it to the screen. I have moved the data and action tags around so my result set is ordered how I like it. Don't run this yet, just look it over and move on to the next step. This looks pretty complicated and working with XML can be pretty complicated but we are only pulling values so lets break it down. We are selecting the event_data column in our temp table and extracting some data. Look back up at the red box in the picture. The event tag is our top level tag so it will be the first element in all of our lines. We are then trying to get name attribute which is why we use /event/@name then we cast that as a varchar(100). The second line is also an attribute for the event tag, the timestamp attribute so line looks the same. We are now moving down to a subtag of event, an action tag named username and we want to get the value subtag of that action so we use /event/action[@name=''username'']/value . Look at the green box in the image above and you can see how they relate. This is very similar to the last example except this time we are accessing a data tag instead of an action tag. This corresponds to the blue box in our image. This is another data tag but this time the subtag we are trying to get the value for is a text tag instead of a value tag. See the purple box in the image, note we could have grabbed both the text and the value subtags here. If you run the code from step 10 now, you should get multiple rows and multiple columns in your output. I have scrubbed the host names and usernames from my output but they did return data. One thing to note is that I cast all the columns as VARCHAR in my code. If we wanted to do any aggregation or computations using some of the values (like cpu_time, reads and writes) we would want to cast those as integers.